Sale kitchen. Design by Architect Mark Burgess. Corian and granite work tops. Natural Oak floor. Metallic gloss kitchen fascias. Polished steel wall radiators. Natural light enters from roof lights. Sunshine from the conservatory is reflected in the oven fascias. 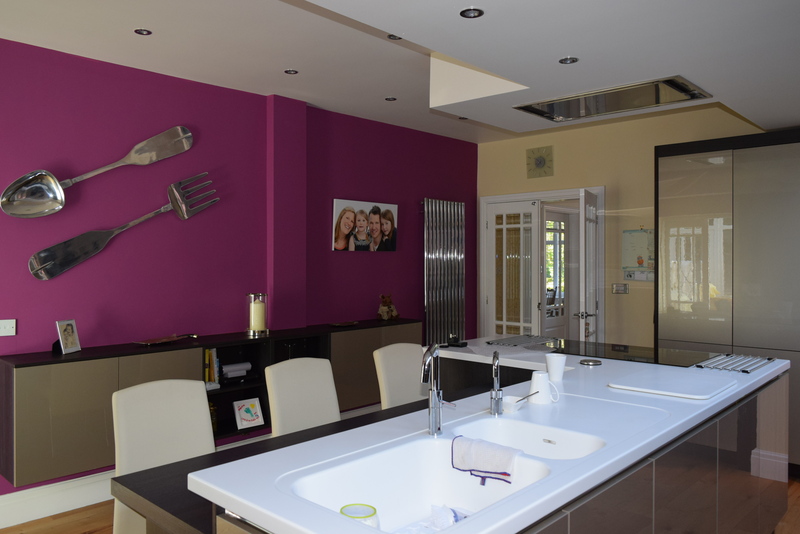 The kitchen has been designed to link the entrance hall and conservatory. A new setting for this Sale kitchen is finished. It’s the latest project in my portfolio. 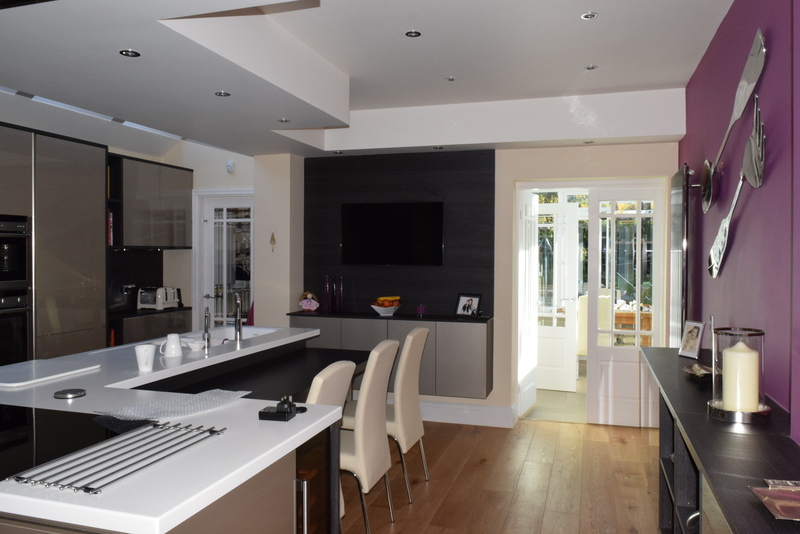 Re-planning and extension created a new interior. It’s design has contemporary values. You Tube Link. Clients Kevin and Anne are delighted. The Sale kitchen was designed and installed by John Crosby. Kitchen Design Centre. 0161 681 5061. Both John and myself thank builder Mike Forbes. He has constructed the extension with skill. Mike has a keen eye for detail. Contact him on 07973 189864 or 0161 928 5392. Structural Engineering was by Howard Johnstone, 0161 962 0571. Howard understood architectural aims immediately. My clients like their Sale location because it’s convenient for business in Old Trafford. But their kitchen was a certain age. So this Sale kitchen needed renewal. The new plan puts a dining kitchen at the core of the house. The design creates a clear route. It runs from the entrance hall through a sequence of spaces. This sequence links the front of the house with a new rear garden room. Sunlight floods into the kitchen from the conservatory beyond. 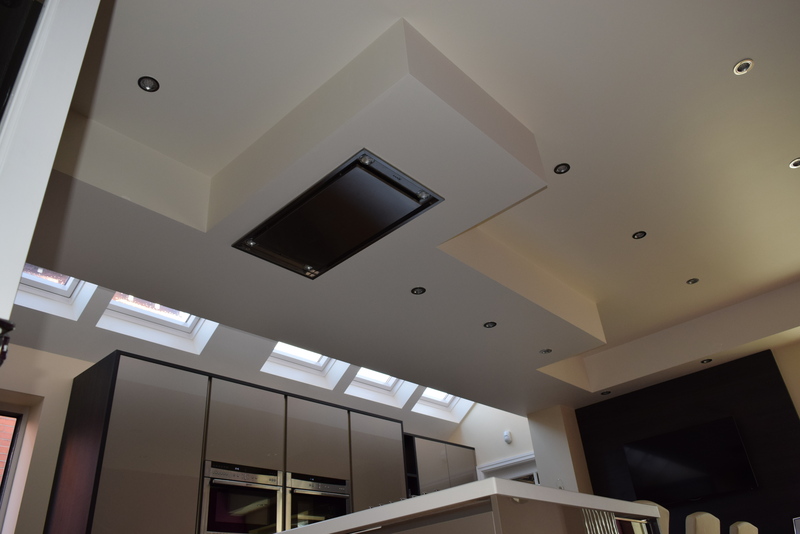 Natural light enters the kitchen from linked Velux roof lights above. But maintaining privacy at the boundary. The design included enlargement of the downstairs toilet. I offer the full range of architectural services. But for this project I was appointed for planning formalities. Also for the technical design. Howard and I worked closely together. The complex steel work needed to create one open space was carefully concealed. The technical drawing was used for the building regulations plans submission. The technical drawing was then developed for construction. My construction drawing was resolved technically. So it enabled Mike to build efficiently. So armed with my thorough information no further interaction was needed. This save fees for my client. And the on site team could build quickly. An excellent builder from Sale. 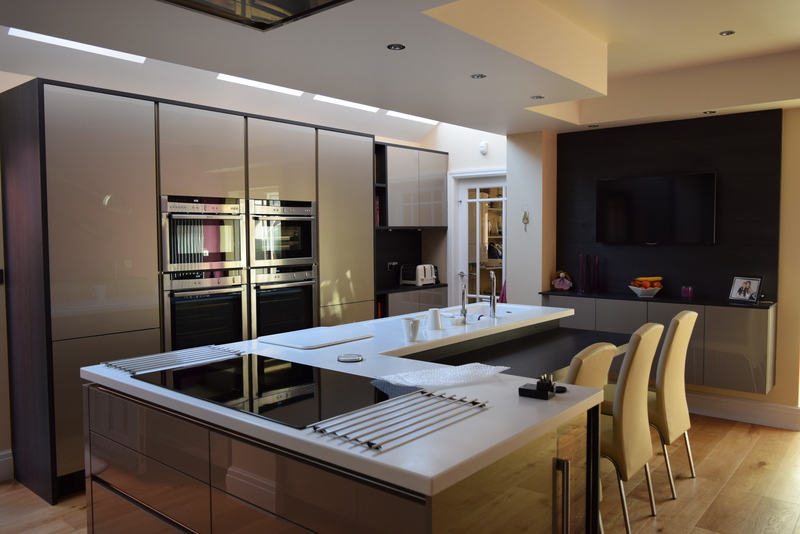 An equally talented kitchen designer and fitters. Thoughtful designers co-operating. Trusting clients with taste. All created the beautiful Sale kitchen you see here. 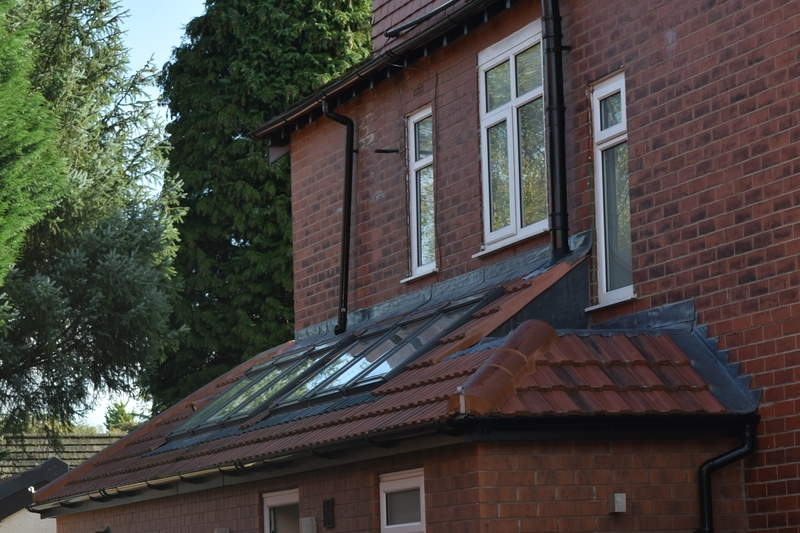 Roof light array & roof design to accommodate existing window. The ceiling conceals extract duct work and steelwork.